Heading to Alabama? Living in Alabama? Make an RV Park or Campground the next place you visit! Whether you are looking to stay on a beautiful white sandy beach or perhaps you were considering a cabin in the woods… we have the Campgrounds with the amenities you are looking for! If you thought camping was all about getting back to nature, it can be! But we also have RV Parks that provide you the perfect place to park your rig and explore nature and return to all the comforts of home! Looking for a swimming pool, fishing for the “Big One”, or just laying around and doing nothing? Our member RV Parks and Campgrounds can definitely accommodate you there, too! The Alabama Association of RV Parks and Campgrounds (Alabama ARVC) is Alabama’s Professional Trade Association for RV Parks and Campgrounds. Alabama ARVC members strive to provide the best camping facilities, amenities, and service to their campers. For your assurance of a great RVing and Camping experience, stay at an Alabama ARVC member park. 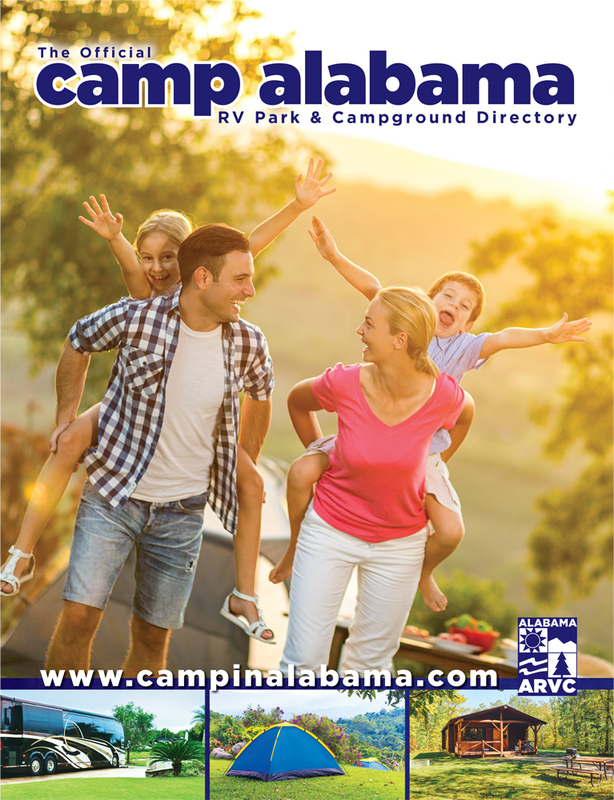 The 2018 Camp Alabama Directory is your FREE camping guide and is the Official Alabama Camping Directory© offering the best parks in Alabama!